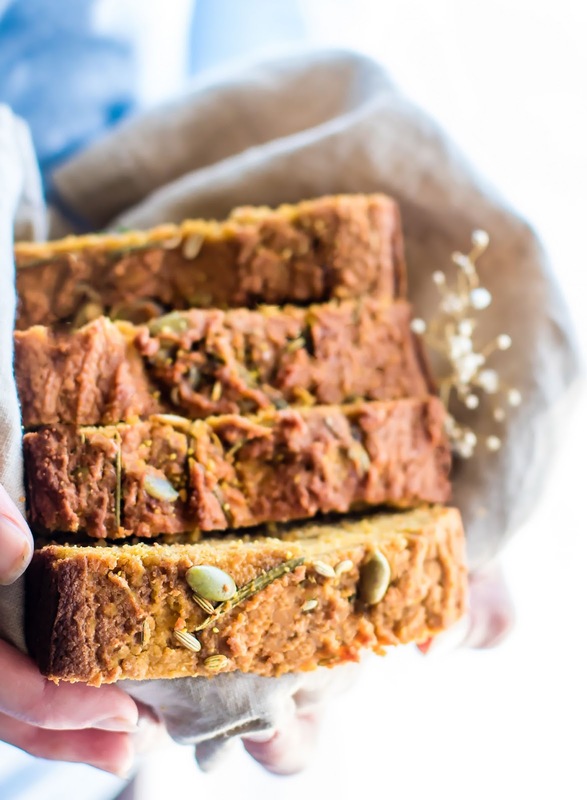 There are lots of gluten free foods that reduce stress and anxiety and although we can’t necessarily CURE stress, we can help reduce stress and anxiety with healthy nourishing gluten free foods! Maybe that’s what your body needs in the New Year. I know it is for me. 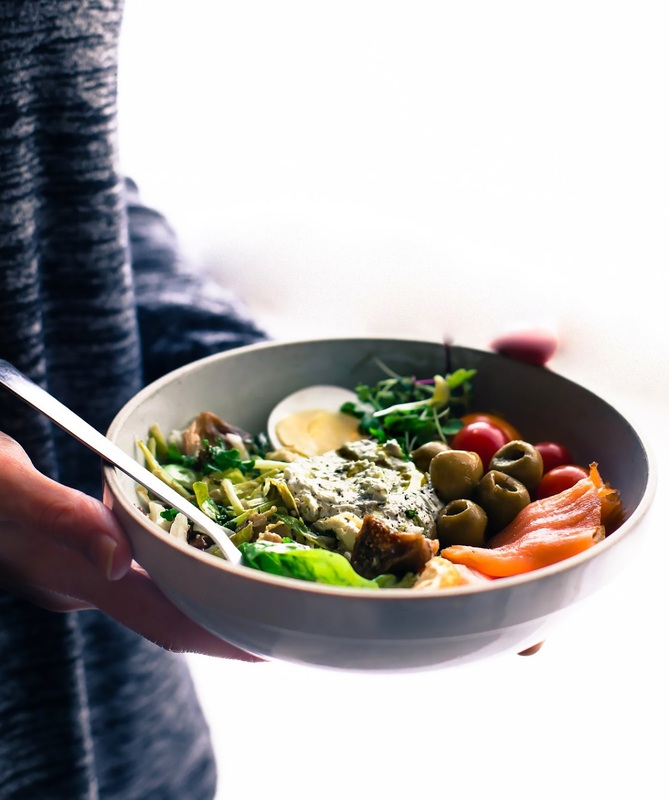 Stress can take a toll on the body’s immunity and other natural defenses, but eating nutrient dense gluten free super foods can offer relief from stress and anxiety. See that title? Yes, of course you did. Maybe you’re curious about it. Gluten Free Foods that REDUCE STRESS AND ANXIETY. Key word being REDUCE not cure, although I wish they did. I’d be GOLDEN and stress free by now if so. Ha! But let me back up a minute here and explain my WHOLE reasoning on why I am posting this type of gluten free meal plan. A stress LESS, reduce stress, stress free meal prep plan. Mmmm k? Can Foods Really Help Reduce Stress and Anxiety? YES! The foods we eat really do affect our bodies. You see, the majority of folks out there are posting their most popular recipes from 2016. Or they might be sharing what they learned from 2016. I love it! Both great ideas. To reflect on positive. But me… oh boy. I dare to be different I guess. I want to reflect on what I learned from the fear and hardships this year and how to TACKLE life in 2017. Life lessons to be shared ya’ll! And how eating certain gluten free foods to reduce stress (or at least help reduce stress) was KEY for me. Stress seems to be inevitable. But maybe, just maybe, we can shift perspective and adjust our diet so we can ENDURE and come out on the other side stronger. Capeesh? This year, my husband and I went through several types of stress and anxiety. Life Changes – Kiwi shifted from retirement as a triathlete to unemployment. Change in Employment – Kiwi started a new job and experienced a career change. You guys, this all happened within a month. Um… it’s been quite the year. Stressful, well, ya. But in a “we so need this change” kind of way. What have I learned from all this? For one, life will throw you curves balls, and LOTS of them. But two, our mental health and well being have a TON to do with how we handle the curve balls of stress and anxiety. If we can feed our brain (with healthy food), feed our gut (with all the prebiotics/probiotics), and learn to rest, we can swing and HIT back a lot of those curve balls. Here’s what I mean. Stay with me here. Your environment and your food choices. Since I am not an expert in the environment part, because I’m still learning to make my environment BLISSFUL, I’ll chat about the food choices. Foods that reduce stress and anxiety, calm us, and nourish us. Pretty much my major need in 2016! What Foods Can Reduce Stress and Anxiety? Foods that can help regulate blood sugar, such as healthy carbs, nutrient dense proteins, lower sugar REAL foods, and high fiber. All these are KEY components to keeping that brain/neurotransmitters firing properly and regulating mood. I love what Dr. Axe says here. Neurotransmitters are your brains “messengers” and control mood, energy levels, appetite, and several other functions in the body. AND they’re significantly influenced by what we eat or don’t eat. So are you ready to get that brain healthy and calm the crazies? I am! 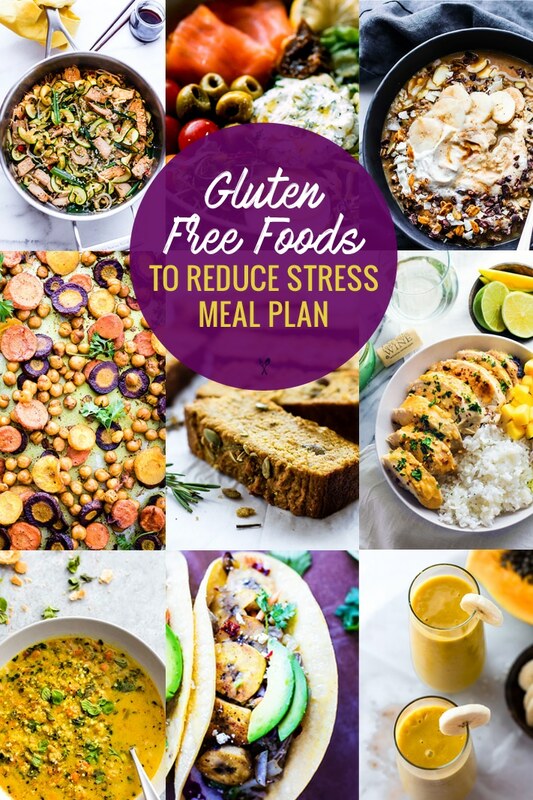 Let’s walk through this meal plan of gluten free foods that reduce stress and anxiety together. Each meal contains gluten free foods that reduce stress and anxiety. IMPORTANT NOTE: Everyone reacts to stress and anxiety differently, and we each digest food differently. 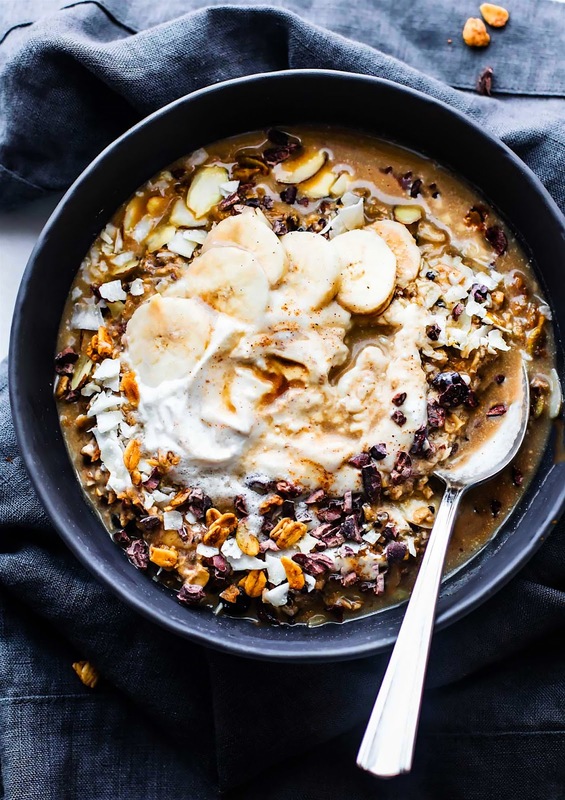 If you have SIBO or are sensitive to FODMAPS, then some of these foods might not be the best UNTIL your gut is healed. Make sense? In the end, it’s all about balance, real food, and resting/digesting. I’m reminding myself here. EEK! At the bottom this Meal Plan, I will share with you my list of kitchen gadgets that save time in the kitchen and make for STRESS LESS meal prep. Sound good? Rich in Antioxidants, B 12 from gluten free Oats, and Cacao is high in Magnesium. Which is a calming mineral. Healthy fats and fiber. Both can help regular blood sugar. 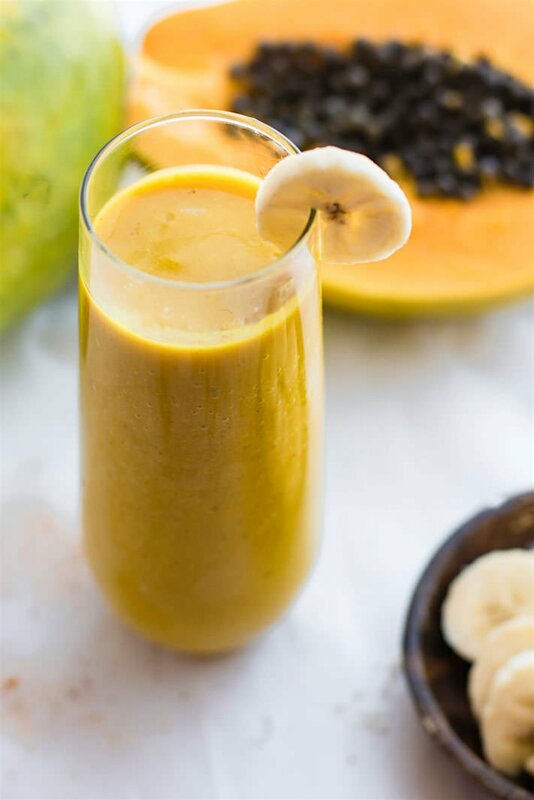 Loaded with anti-inflammatory properties with the turmeric and coconut milk for healthy fats. Pineapple is also high in tryptophan to help produce serotonin. Rosemary and pumpkin are a great combo here. The pumpkin is high in fiber and Magnesium. Plus it acts as a healthy gluten free carbohydrate to regulate blood sugar and boost serotonin. The Rosemary has been linked to boosting mood and reducing stress in those with chronic anxiety. Salmon, olives, and goat cheese oh my! So much healthy fat here. 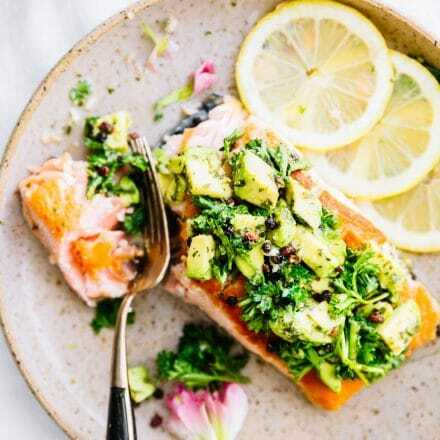 Helps regulate blood sugar and salmon of course is high in Omega 3’s and DHA/EPA/! The leafy greens like kale and spinach are rich in folate, . Folate (a B Vitamin) can help body produce mood-regulating neurotransmitters (i.e serotonin and dopamine). 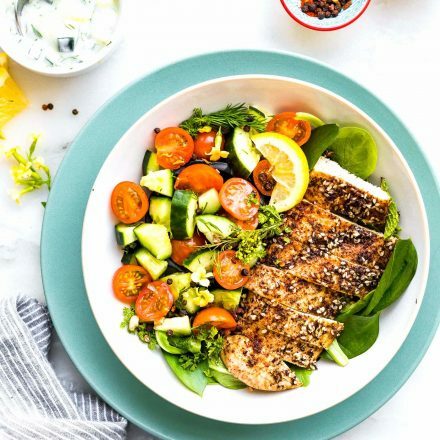 Cod is light fish and a great source of protein! It also is a good source of Omega-3s, which can aid in the production those “good mood” neurotransmitters, including dopamine and serotonin. Turmeric is one amazing anti-inflammatory rich spice. It also helps with blood sugar regulation. Pari that with the healthy fats in Tahini and anti-oxidant carrots and you will be HAPPY and worry free in no time! 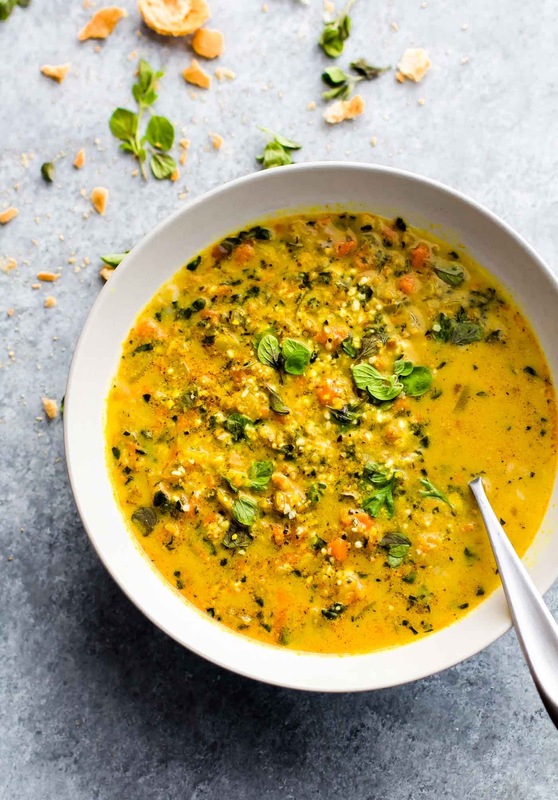 One of my very favorite soups! The curry has so many wonderful power spices. Turmeric (as mentioned above), but also these spices contain a good source of Vitamin B6, Folate (another B Vitamin), Calcium, Magnesium, and, Potassium. I love this bowl! A balance of protein, healthy carbs, and fat. I call this a power bowl for healthy blood sugar levels. Plus the mango adds extra fiber. Another FAVORITE paleo bowl. 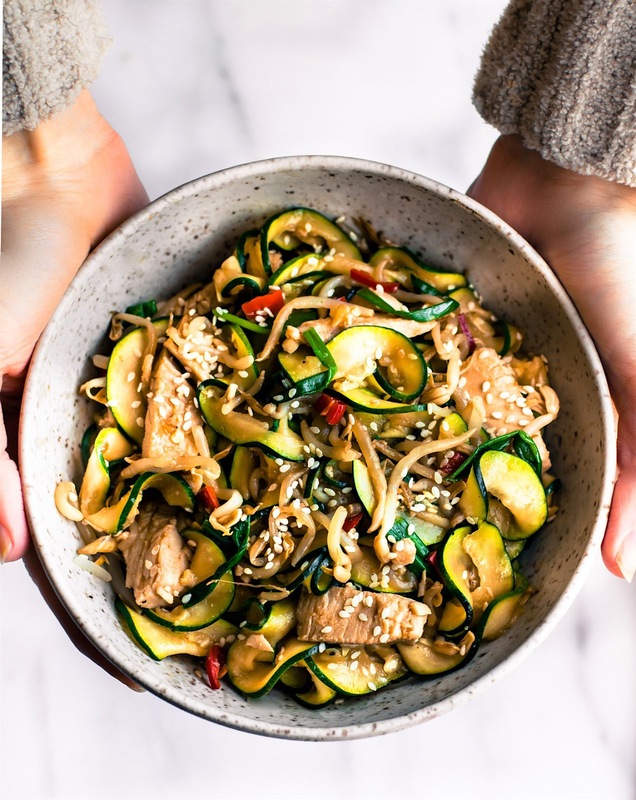 This turkey chow fun tamari zoodle bowl is packed with protein (turkey) and ginger for extra ant-inflammatory properties. The Turkey is high in tryptophan, which can be used to produce serotonin (the calming neurotransmitter, when in balance). 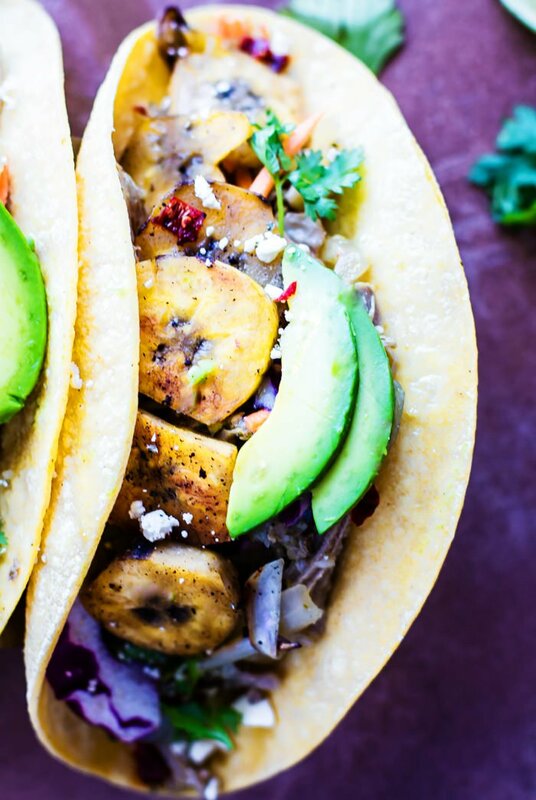 These tacos are slow cooked to perfection. The Pork tenderloin contains a good source of Vitamin 12 and zinc (another mineral good for feeding the brain.) The plantains are lower in sugar than bananas. These tasty starches are a slow release carbohydrate and contain a good source of fiber! 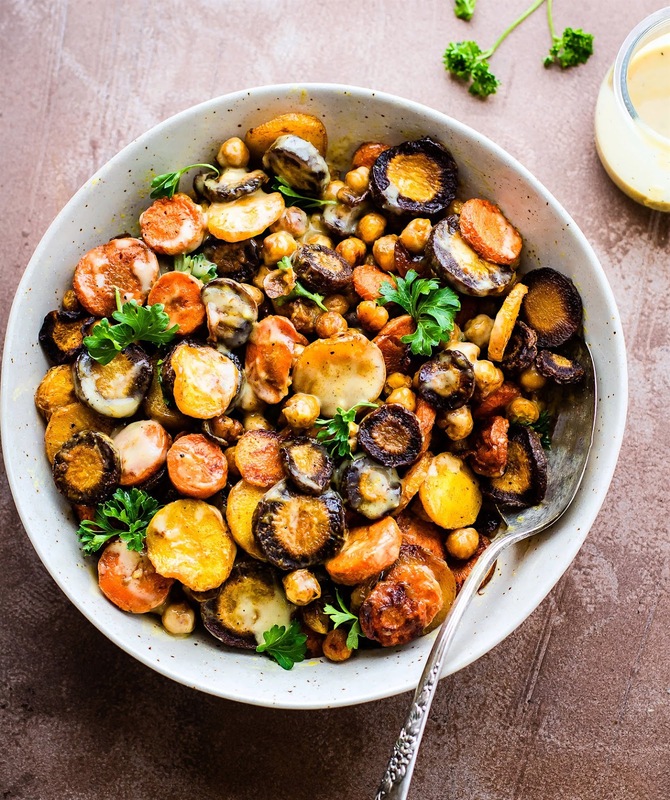 All those spices and veggies pack in a lot of antioxidants. OK, now that I’ve let you in on my favorite foods that reduce stress and anxiety, and CALM the brain and body, let’s talk meal prep. I normally would share a grocery list here, but I kinda think this list is way more needed for the meal plan. 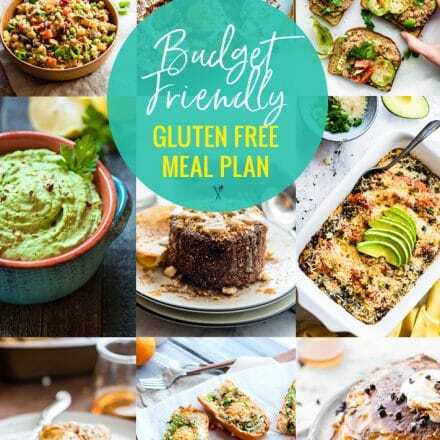 A gluten free meal plan of foods that reduce stress and anxiety NEEDS a stress free meal prep tool kit. Dontcha think? Here are my LIFE SAVER TOOLS! 3 Speed Hand Blender – I use this a lot to quick puree soups, chowders, or even a simple smoothie. Super FAST clean up. Three-in-One Stainless Steel Food Container Set – This has been our go to for quick meal prep and lunches. Love all the sizes and it’s durable. Mandolin slicer with storage (3 blade) – Quick to prep veggies or slice toppings for sandwiches, burgers, etc. Again, super easy clean up and quick storage. Non Stick Wok – Finally a wok that is easy to clean for stir fry! YES! 5 blade Spiralizer – My go to for spiralizing all the things! I love the different blades. As you can see, I used a different blade for the Tuna casserole dish. Thicker. This spiralizer is durable and easy to clean. No stress! Simply Organics Spice Kit (starter) – Instead of a bigger bottle a spice I don’t use often, I found these spices sampler packers make testing out recipes more user friendly and budget friendly. Rice Cooker (Multipurpose) and Steamer – I cook almost ALL my gluten free grains in the rice cooker. 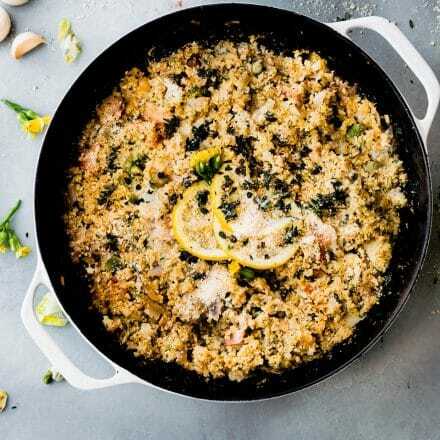 Oats, quinoa, rice, and even lentils. Saves on time and I don’t have to watch the stove. 6 Quart Digital Slow Cooker with Timer – Another meal prep life saver. This slow cooker has a timer so you know when it is ready. Plus it has 4 settings. Low, medium, High, and warm. Snap n’ Strain – OMG I love this thing. I don’t splatter stuff everywhere and it drains pasta and noodles fast fast. I also love their Stand up Bag pour holder. So you don’t have to try and pour everything in a bag with one arm. LOL! Totally been there. I just wrote my longest post of the year. Like whoa! Can you tell I am passionate about this topic? Mainly because I am living it. Currently. I think we all go through bouts of high stress and life transitions. It’s good to have a support system and a plan of attack when you start feel that pressure. That being said, let’s start off 2017 with NO pressure and all super duper PLAN for LIVING life fully! Healthier minds, healthier bodies, and healthier relationships! FLOURISH in 2017! Reduce stress with this#healthy #glutenfree meal plan and #mealprep tools! Do you have any favorite gluten free foods that reduce stress and anxiety for you? Tell me one way you are going to reduce stress in your life in the new year, because I know you can. And help keep me accountable, too. Mmm k? See you next year ya’ll! *This post does contain some affiliate links. Thank you for supporting Cotter Crunch in 2016! Yes to less stress! I love this. Thank you friend! How are you feeling? Yeah, I’d say you’ve had a little stress. I’ve said nothing to you about moving because I thought if I ignored the announcement that it means it didn’t happen — so sad. Haha, it’s happening! Come visit. Well, in summer. Much cooler! Your photos are gorgeous and the various dishes are so appetizing. Who cares about healthy — they look delicious! Happy New Year! I’ve pinned this list to use many times next year. 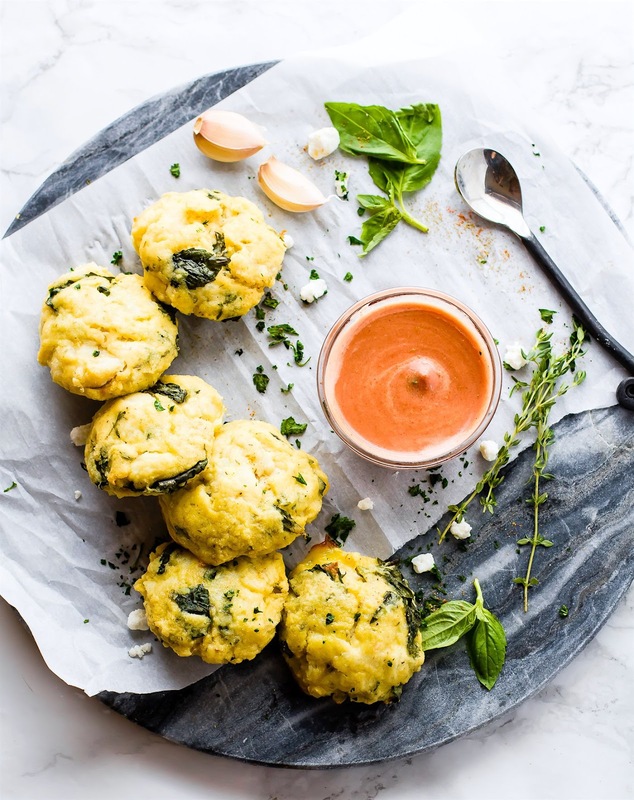 We eat a pretty gluten reduced diet and there are so many beautiful dishes you included in this round-up that are making my mouth water. Wonderful! Keep me posted Jamie! Those Cuban Pork Tacos are calling my name! Oh yum!! Thanks for all the GF recipes! oh those are my fav!!! I think we could all use a little less stress in our lives! And some things you can’t control (like surgery and job loss), but we can control what we eat. 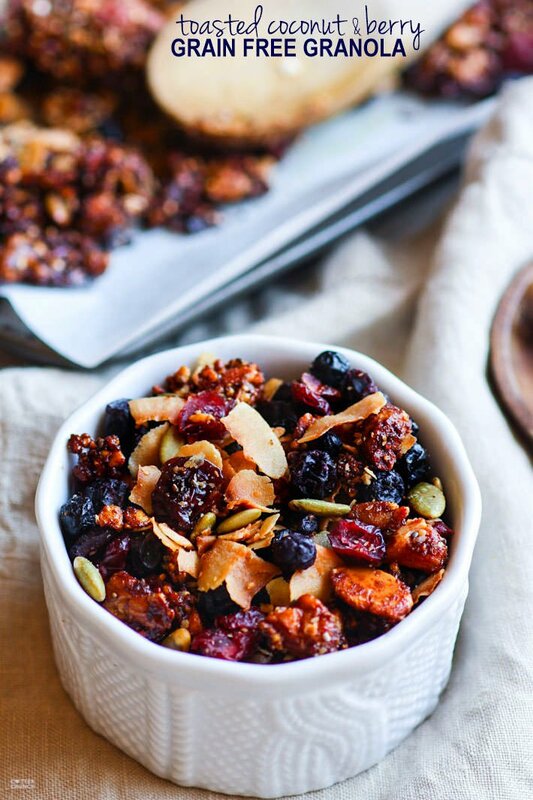 Every single recipe here looks amazingly good and packed full of nutrients. An excellent list to get us into the new year. I should prepare them all. Festive season always makes me super stressed, even more than usually. Right? I hope this helps and you can enjoy the little bit that’s left! You and Kiwi deserve all the best, and I hope that you find just that in Utah and in 2017! I truly hope that in 2017, you are able to absorb and enjoy the fruits of both of your labors from this past year–that you can return to your workouts and your favorite foods, that you can experience all the Utah has to offer, and, of course, continue to create and inspire! Thank you so so much for all your support! And Oh same to you dear friend! <3 you are amazing and I wish you the best in 2017. Baby making and beyond. It sounds like 2017 is going to be such an exciting year for you as you settle into life in Utah! These all look amazing. I know you’re loading up right now! I think we all need this after the holidays. Turmeric cheers, bro! I need turmeric x 10! Stress has been my constant companion over the last 2 years as I too have come out of retirement, moved my family from Cornwall to Atlanta (culture shock!) and became a grandmother. Looking forward to de-stressing in 2017. 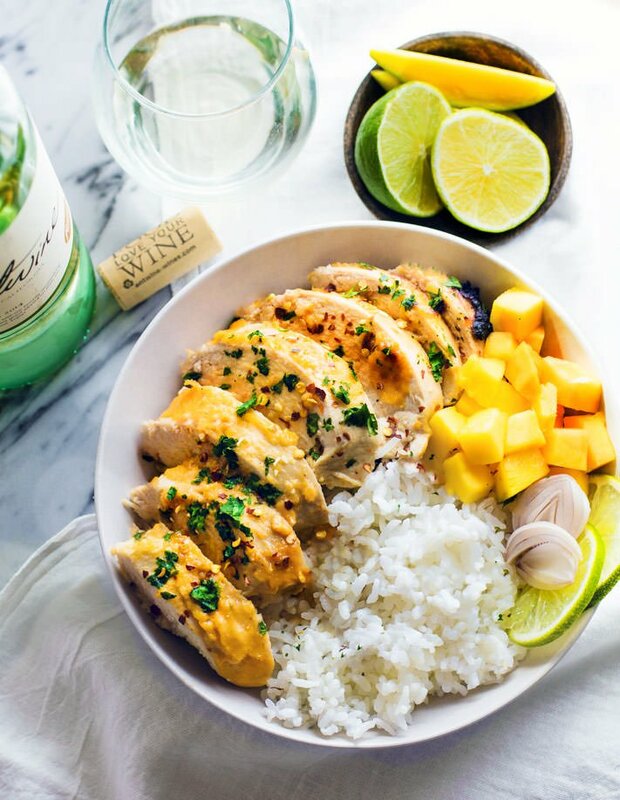 This meal plan looks yummy and I cannot wait to try it. Looking forward to more in 2017! Cheers! I feel ya! Yes to de-stress in 2017!! Keep me posted and happy new year friend! I was diagnosed as Diabetic about 3 years ago, but it was so new, so stressful and I had a newborn and 3 other children to take care of that I just took my meds and didn’t try to change too much at once. Fast forward to now and I’m ready to change everything, get off these meds by the end of the year and feel on top of my health. My Endocrinologist suggested not only a low carb way of life, but grain free / dairy free as well. I am trying to ease our entire family into that way of eating and it’s not easy, so thank you so much for these awesome meal ideas!! I’m so glad you are able to get some relief with healthy food Jen! Let me know how else I can help. Best of luck with the Family! And way to live by example!